This afternoon at the Majestic Theatre, the theatre and TV community gathered to celebrate the life of the one and only Beatrice Arthur. The actress, who died this past April at the age of 86, was more than actress and comedienne; she was an icon. Her statuesque presence, her incisive cutting way with a line or a glare and that baritone voice were part of the unique package that make an unlikely star of the working actor at the age of 50. There were many stories recalling the actress' spontaneity and charm. One example of her spontaneity (and genuine love for animals) was how she saved a dog on Sunset Boulevard - then found out it was Barbra Streisand's dog. The script supervisor of The Golden Girls recalled special moments with Bea, and was in charge of getting the ladies to sign photographs. On one afternoon during the height of Bobby McFerrin's popularity, he successfully dared her to sign "Don't worry, Bea Arthur." 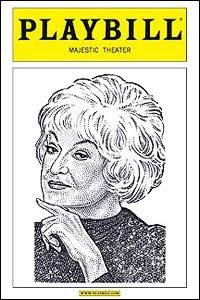 I will certainly never forget Bea Arthur's presence in my life. Every weekend as a kid, I would stay at my Grandmother's house and wouldn't you know it, every weekend I would sit and watch those 4 ladies on The Golden Girls . Bea's character Dorothy Zbornak always held a special place in my heart. As I began to work on stage, I found myself, as many bass-baritones do, playing the old man. The old man, in operatic terms, generally serves one purpose: that of comedic frontman. I often thought about Bea's brand of comedy - her Dorothy and Maude - considering her ability to say everything with just a look and her timing with a line. And what timing it was. At the opening night of Bea Arthur on Broadway, Rue and her husband were invited to the show and afterparty. Her husband went over to introduce himself to Bea, who was sitting at a corner table with her back to everyone and thanked her for the invitation. Bea turned and looked at him for one of those trademark beats, then grabbed him and drunkenly slurred, "You're Rue's husband! I love Rue ... *trademark pause* ... Betty's a c#nt."